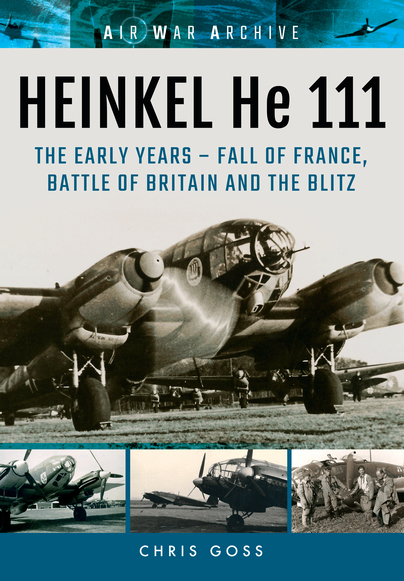 You'll be £12.00 closer to your next £10.00 credit when you purchase HEINKEL He 111. What's this? The Heinkel He 111 was the main work-horse of the Luftwaffe’s bomber force throughout much of the Second World War. Consequently, when Hitler launched Operation Barbarossa in June 1941, three entire Kampfgeschwader consisted of He 111s. Initially used as direct support for the German ground forces, as the campaign progressed the He 111 was switched to attacking the Soviet infrastructure, particularly trains and marshalling yards, and used as a transport aircraft taking in supplies and for troop evacuation. Variants of the He 111 were used in anti-shipping roles, in both the Atlantic and the Mediterranean, and even for aerial launching of V-1 flying bombs, continuing the war against the towns and cities of the United Kingdom. In this selection of unrivalled images collected over many years, and now part of Frontline's new War in the Air series, the operations of this famous aircraft in the latter years of the Second World War are portrayed and brought to life. 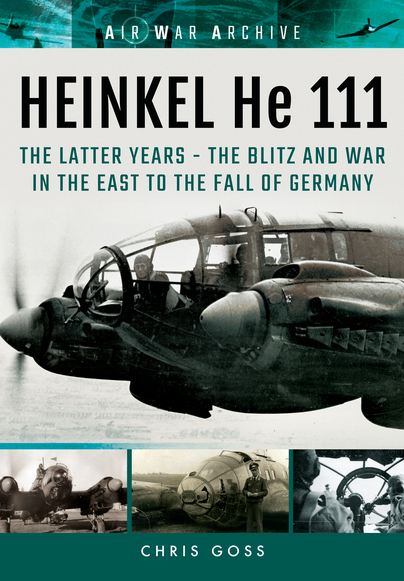 A companion title to Heinkel He 111: The Early Years. Whilst the Heinkel He111 has been well covered already, this book does contain some new photos of the type, and at a very reasonable retail price I can recommend it to anyone wit an interest in World War Two, the Luftwaffe in general, or the He111 in particular. The book is rounded off with wartime colour images, inevitably faded, but highly interesting nevertheless. Essentially a ‘follow-on’ to ‘Heinkel He 111 – The Early Years – Fall of France, Battle of Britain and the Blitz’, one of the first books in Frontline's ‘Air War Archive’ series, also by Chris Goss, this latest compilation has well over 220 b&w photographs, plus seventeen in colour, and continues coverage of the night Blitz against the British Isles throughout 1941, with some fascinating shots of the variations in the temporarily-applied black camouflage applied to night-bomber He 111s and photos of ‘Luftmine B’ aerial mines, which is then followed by separate sections covering operations in Russian and the Mediterranean, initially in 1941, and then in the 1942 - 1943 period, culminating in the 1944 -1945 period. For the aviation historian and the modeller in particular, this will be just the sort of reference you will like. There are a variety of colour schemes, some of which are more unusual, the same with some of the markings. We see aircraft in flight, on the ground, derelict, crashed and even cut up at the end of the war. An interesting mix of bombs being carried, including the V1 for air launches, a barrage balloon deflector and more. Add the variety and detail of uniforms and aircrew equipment, there is lots of useful reference detail to be found. Another useful addition to this growing series. Well-known author and FlyPast contributor Chris Goss is the man behind this excellent collection of images depicting one of the Luftwaffe's best-known World War Two bombers. Unlike titles on the Luftwaffe before it, Goss' work, which is the second installment on the place, produces a crunching impact on the reader. Latest Chris Goss title in the Frontline 'Air War Archive' series is this neat photo monograph devoted to the Dornier Do 17. While the type was the Luftwaffe's principal light bomber at the outbreak of war, helping to spearhead Germany's Blitzkrieg in Poland and then France and the Low Countries, heavy losses at the hands of Fighter Command in the Battle of Britain saw the type largely superceded by the Ju 88 so that by the summer of 1941 and the invasion of the Soviet Union, KG 2 was the only Dornier Do 17-equipped bomber unit. This book is a compilation of decent wartime images nicely reproduced over 136 pages in a slightly larger than A-5 softback format at a very reasonable price complementing the volumes already published in this series on the Bf 109, He 111 and Ju 88. THE LATEST offering from the Air War Archive is Chris Goss’ Heinkel He 111: The Latter Years and this collection of fascinating images follows an aeronautical icon into the heart of military darkness. Covering the years from the Blitz to the demise of Adolf Hitler’s Nazi Reich, but unlike titles on the Luftwaffe before it, Goss’ work, which is the second instalment on the place, produces a crunching impact on the reader. The lack of editorial content, minus an introduction and photographic captions, creates a deathly chill as you slowly follow this outdated and outmoded aircraft and its crews to its final destruction in the ashes, after an initial stumble and proof of weakness in the Blitz. Opening images taken from over Europe are of almost casual unfettered flights, without the need for fighter support. Personnel pose in front of their beloved 111 in Schipol, Holland and all seems well, there are some excellent images of rebuilt aircraft f e a t u r i n g Jumo 211F-1 engines and cable-cutting e q u i p m e n t and barrage deflectors, but the real interest comes as the war takes a new route. R u s s i a and The Mediterranean is the second section of the book, and the number of crashed and destroyed 111 rises at a shocking rate. As the pages turn the destruction carries on unabated, in one fantastic shot a 111 is seen enveloped in fire after being hit by flak over Lvov in the Ukraine, the seconds before death brought home starkly. victory reach their culmination, grounded in the dust of Eastern Europe and finally Germany.